The “Fire Weather Climatology” module provides a comprehensive look at fire regions across the United States and characteristics of typical fire seasons in each region. In addition, critical fire weather patterns are described in terms of their development, duration and impact on fire weather. Numerous case studies provide examples and opportunities to practice recognizing these critical patterns and how they can affect fire ignition and spread. This module is part of the Advanced Fire Weather Forecasters Course. The training is set up in a way that is clumsy, with random links. Instruction or walk through during some of the case studies would be extremely helpful. What an awesome course! This will REALLY help me in our next fire season. I learned a lot. Very lengthy, however this lesson included very detailed information for someone who is not familiar with the Western US climatology. At the end of this module you should be able to: 1. Identify critical fire weather patterns across North America and describe: * Basic set-up, effects on fire weather elements, and typical duration of each pattern * Characteristics of each pattern that contribute to fire ignition, spread and intensification. 2. Describe locations of key large-scale air-mass source regions and the air mass characteristics that impact fire weather. 3. 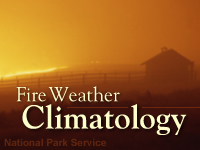 Identify typical fire seasons for fire climatological regions of the United States and Canada and the critical fire weather patterns that affect these regions.